Have you ever decided to sleep on something, or wait to get something, only to lose out on that something? I’m all for making sure it’s the right thing for you. I like to have the facts, the benefits, and the costs all laid out before I make a decision. If there’s a lot of pressure to act quickly, I sometimes just say no on default (it depends who’s asking, honestly). But man, does that backfire sometimes. Back in March of 2014, a friend mentioned Penned Con as a conference I should look into. I added it to my list of conferences to look at later. A few more friends pointed out this conference, and I always put it on the backburner, telling myself I’d get more information when I wasn’t busy. When am I not busy? It wasn’t until the conference came up again in an interview with Chanda Hahn last November that I finally took a deeper look at the event. And MAN it looks awesome! It’s all about YA authors, their readers, and the characters that drive these stories. It’s a virtual YA-palooza. And I missed it because they were sold out for 2015. Thanks to dragging heels and an “I’ll do it later” mentality, I have to wait until at least 2016 to go. I’m bummed. But I can guarantee I won’t drag my heels again. Considering my mistake, I don’t want you to make the same. Last month, I launched my Haven: a life-changing community for writers of all kinds. It’s a fun hub of connection, creativity, and accountability. I’d hate for you to miss out, so head over to the Haven and experience it for yourself. You long for accountability to keep you writing every week so that you don’t fall behind or give up. You’ve been searching for a community of like-minded writers to support and encourage you. When you write, a fiery spark of pure life lights you up from within. Sound like your thing? Awesome. We’d love to have you. 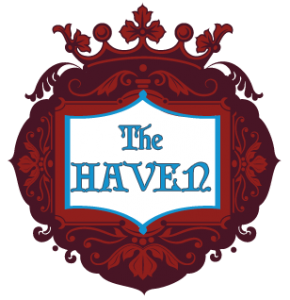 Click the badge below to head to the Haven and discover it for yourself. And don’t be like me, with my feet-dragging nonsense. Ugh, lesson learned.